Nick and I are going for a trip down the Missouri River from the tiny town of Rulo, Nebraska, to Kaw Point, a park where the Kansas River drains into the Missouri. He has been talking about it all summer. We have the canoe. I’ve bought a new dry bag and a cell phone charger. We just have to get a small, waterproof case for the cellphones, go the grocery store, affix the canoe to the top of the car, and we’re off. Nick’s looking forward to the trip because now that he’s had a taste of the Missouri, he wants more. 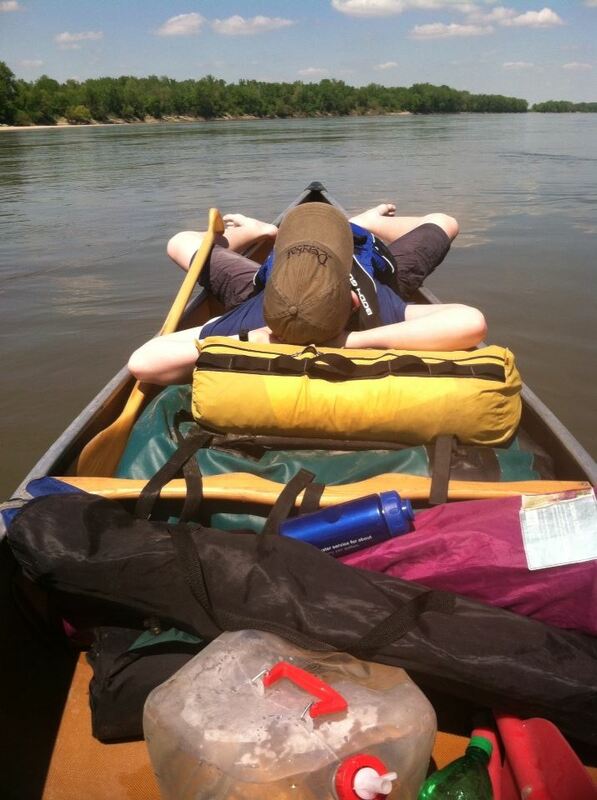 He and I went with an anarchic group of paddlers from Jefferson City, Missouri, to Hermann in April on the Missouri. We arrived the Friday night before the float and met with about 35 paddlers and the people who had come to see them off. Together, there must have been about 60 people there. This disparate group ranged from the young (Nick, 14) to about 70. Members of the city council and the Mayor showed up to visit. American Water provided coolers of cold water and water bottles. A local beer distributor brought Budweiser and Bud Light. News crews came with their cameras. As the sun set, the river flowed like a mirror. The capitol dome and the city reflected off the river. When the dark settled, streetlights shown on the river’s surface like fireflies. The beach at the park across from the city is a wide bowl of sand that comes down off the bank into a large flat area along the riverbank. They city had provided firewood for us. People sat around the fire. A couple of people had guitars and played while their compatriots sang. Conversations started and died down, giving the night over to the silence of the river. Nick and I headed to bed early. Who knew what the next day would bring? Every paddler dreads the wind that can blow up from downstream and push their boats up the river. The night was quiet and windless. We all hoped for a calm day. Early enough, Nick and I got out of our sleeping bags and began, with everyone else, to strike our tents and get our gear ready for the day. Everything buttoned up, we hauled our stuff to the bank and set it in a pile. We brought the canoe down and packed our gear in it carefully. Nick is a skinny little kid. I am an old fat man. In order to balance the boat—so that the front where Nick would be sitting wouldn’t tilt up and make a perfect sail for any wind—we packed most of the gear forward. One of our mates, a woman who had wide canoeing experience on white-water streams, stood at the bank. She looked out over the water. Anxiety overwhelmed her. She had never been on the big river, and now looking at it, she was ill. She asked a hundred what ifs? What if the wind comes up? What if I run over a wing dike? What if I capsize? I shared her fear. The river always makes me anxious, particularly when I’m with someone else. By myself, I can bear the idea of the big water. I swallow the fear and get going. I know what to do, I have navigated over 2,000 miles of this river. But as I stood there thinking of my son, scenarios went through my head. A rocky wind dike would rip out the bottom of the canoe. The boat would capsize, sending my son to an early death. The wind might hang us up all day. We might have to canoe the river at night—my biggest fear. We slid the boat into the water and pushed ourselves away from the sandy beach. Soon we were in the middle of all that water. In the river, when you’re going the speed of the water, it feels as if you’re sitting still and the banks are moving by you on their own. It’s almost like the earth is turning under you. We experienced that feeling almost immediately, and the sort of vertigo that comes with it. Nick showed no fear. As a matter of fact, about an hour into the trip, he stood in the boat to adjust his pants. I remembered when I first put my boat in the Missouri so many years before, it took me a week to gain the courage to stand in the boat. He trusted me. He never thought twice about it. The day was sunny. A slight breeze came downstream and kept us cool. Nick paddled sometimes and played with a string with a hook he made from a wire clothes hanger. As we pulled up to sticks and limbs, he cast his little grappling hook out to get them. He played this game on and off all day. The miles flowed by us and before we knew it, we had covered the 27 miles from Jefferson City and pulled in on the boat ramp at Chamois. The park at Chamois has four camping pads—gravel parking spaces with electrical and water hookups. Each had a metal fire ring. As the paddlers came in, they claimed their spaces. As the evening turned, the paddlers all made their meals. Several fetched firewood for later. Conversations happened in little groups of four or five. Many of us walked around visiting the groups through the evening. The woman who had so feared getting on the river that morning pitched her tent near ours and took up in a camping chair. The day, she said, started fearfully. But after a few hours, she got the hang of it. The next day, flights of paddlers took off from the boat ramp for the 20 miles to Hermann. At a distance, they looked like dragonflies buzzing over the river. The day was warmer and the wind changeable. The miles passed by with hardly a breath. The wooded hills rose up from the side of the river 200 or more feet above us. At one point, we paused to watch a bald eagle watching us from its perch high in a cottonwood. We had to paddle against the wind only a few times. Otherwise the river and the weather were kind. When we arrived in Hermann, he concluded that our journey was a complete success. Now, we approach our August trip. It will be just he and I. We will take our time doing the 137 miles of river ahead of us. If we are lucky, we will find those perfect sandbars to camp on. We will build big fires and throw a line in for a catfish. Evenings will roll over us. We will hear the massive silence of the river. I still fear all the things that can go wrong on the big water. I have never spoken of my fears to Nick. I have told him matter of factly about what to do if the boat goes over, how we need to stay wide of the wing dikes and buoys, and what to do if we come along a barge packet. We will wear our PFDs the whole time. He sees our Missouri River trip as the summer’s big adventure. I am anxious. The river always confronts me with my darkest fears. But once I’m on it, I am in my element.